Materiality is becoming an evermore present pillar in the practice of Brosinski. She distances herself from traditional painting techniques and mediums through often bleaching, staining, washing, drying, trampling and marking her canvases. 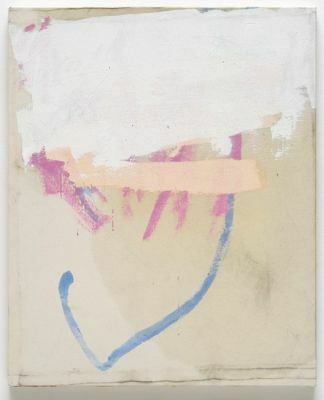 The raw nature of her unprimed canvases allows for the traces of her use, the wear and tear of her painting process, to be revealed, bringing in Brosinski’s essential materiality. It is through Brosinski’s openness for reduction but also creatively induced destruction via painted or strayed gestures that her work becomes a battle for absolute composition. Working in waves of multiple canvases at a time Brosinski strives for complete spontaneity in her work. 'I want to loose control'. This is paralleled with extended periods of reflection, composing herself before the next dramatic step. Brosinski stretches the boundaries of painting through exploring the infinite possibilities which the practice holds. Catch me if you can challenges the format of display while giving an insight into Brosinski’s labour intensive process. In the studio Brosinski’s works are constantly in a state of flux, being stretched and unstretched, working against the wall and on the floor. Brosinski explores the parameters of a painting allowing the works to be presented in numerous forms, stretched, unstretched, partly-stretched, and hanging. With a playful copy and paste style Brosinski appropriates what she has found via art history, contemporary art, films, music and literature. The flashes of these influences allow her to consciously combine fragments, abbreviations and gestures transforming them into an independent work with its own visual language. Steven Spielberg’s Catch me if you can (2002) is a favourite movie of Brosinski’s. This movie is about a charming impostor with an ever-changing disguise, who gets into cat and mouse game with the police. Bringing into question identity and truth which are so prominent in Brosinski’s work. Connections like these are those which excite Brosinski. Conversations with cartoon characters, dustbins, insects, the human form, common phrases, numbers all creep into the work. Yet, they hide, they are unclear, ambiguous on the canvas. The abstract nature of the work leaves their interpretation open ended with the viewer allowed to create their own narrative. Jenny Brosinski (b. 1984 in Celle, Germany) completed her undergraduate and Master’s degrees at the Weißensee Academy of Art in Berlin from 2006–2012. She was awarded the Elsa Neumann Scholarship in Berlin in 2011, the Fellowship Akademie Schloss Solitude Stuttgart in 2012, and completed the Pilotenküche residency at Spinnerei, Leipzig in 2015. Brosinski has exhibited in many countries including, Belgium, Germany, Italy, UK, Denmark, Australia, USA, amongst others.